An Enterprise level Digital Asset Management system supporting over 37,500 users. The University of Queensland (UQ) is in the top 100 universities worldwide, measured through a number of major independent university rankings: the Academic Ranking of World Universities, Times Higher Education World University Rankings, QS World University Rankings and, Performance Ranking of Scientific Papers for World Universities. UQ is also the largest university in Queensland. 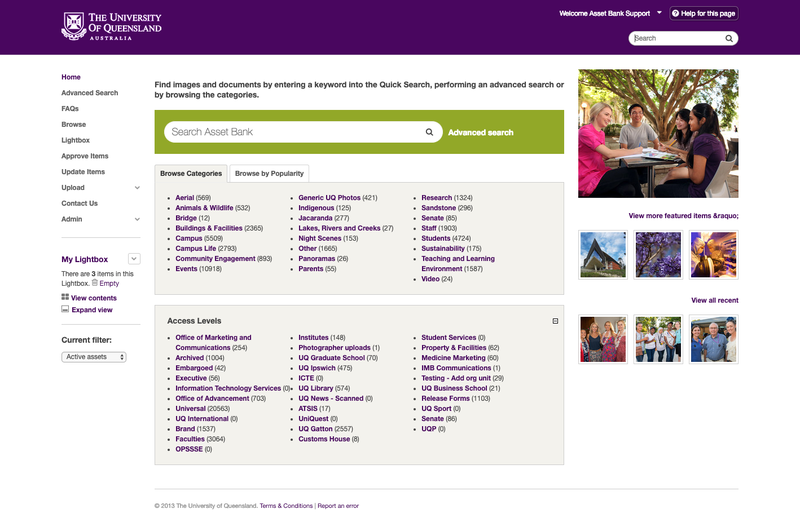 As a world-leading university, UQ required a robust Digital Asset Management solution that could easily store a large variety of images, documents, and other assets. It was vital that their new system could manage 30,000 users with different access levels by role (e.g. administrator, user and contributor) and by group (e.g. school, faculty and department). 114 different user groups were created, tailoring each group’s permission levels for viewing, uploading, editing, and downloading assets. 44 different Organisational Units were set up so that sub-administrators could be created and delegate responsibility for actions such as approving uploads, edits or downloads of assets. Overarching super administrator responsibility remains with just a few users. Automatic access for staff and students is controlled using Lightweight Directory Access Protocol (LDAP) to integrate their DAM system with the UQ Directory. This allows the automatic addition of new users, mapping them into the correct permission groups, and automatic removal of users when they leave the University. Rights management information is clearly labelled on assets and is shown during the download process to reinforce the importance of this information. Users can link related assets together if they are from different sets. Assets can be archived so they are no longer visible to standard users, but can still be seen by local or super admins. Find out more about the University of Queensland or why not try Asset Bank for yourself?